"We analyse the role of AT in foreign exchange (FX) markets in a period containing the 15 January 2015 announcement by the Swiss National Bank that it had discontinued its policy of capping the value of the Swiss franc against the euro. This ‘Swiss franc event’ represents a natural experiment as one of the largest shocks to the FX market in recent years and probably the most significant ‘black swan’ event in the period in which AT has been a prominent force in FX markets. In particular, we study the contribution of AT and human traders to two important dimensions of market quality, namely liquidity and price efficiency. Our analysis is based on a unique dataset with a detailed identification of AT obtained from EBS Market, which is the leading platform for electronic spot FX trading in many of the major currencies. A detailed understanding of AT in distressed situations is important for at least two reasons. First, a better comprehension of whether AT is beneficial or detrimental for market quality in extreme situations would help inform the ongoing reform of trading venues. Second, the resilience of an exchange system depends on the behaviour of different types of market participant and their reciprocal influence on each other. For instance, a tendency of AT to offer liquidity in calm markets and withdraw it in distressed situations could lead less sophisticated agents to become reliant on high levels of market liquidity only to find it in short supply when they most needed it. If these adverse consequences of AT were predominant or not offset by other traders, then AT could represent a systemic threat to the whole trading system. To shed light on this key issue for financial stability, we analyse whether human traders and AT substitute for or complement each other in supplying and consuming liquidity. We proceed in three steps. First, we describe the EBS Market platform and our sample of data from it. Second, we perform an in-depth analysis of market liquidity and price movements by decomposing order flow, effective spreads and intraday volatility by type of trader. This enables us to highlight the contribution of AT and human traders to liquidity provision and consumption, transaction costs and realised volatility. Third, we study the contribution to efficient pricing of AT and human traders. Our study delivers two important findings. First, in reaction to the Swiss franc event, we find that AT tended to consume liquidity and reinforce the price disruption. Opposite and offsetting patterns apply for human traders, who supported market quality by providing liquidity and aiding price discovery. Second, we find that this market quality degradation coming from AT was concentrated in the shocked FX rate (EUR/CHF) and, to a lesser extent, USD/CHF. Non-CHF currency pairs (USD/JPY, EUR/JPY and EUR/USD in our sample) were essentially unaffected.3 This suggests that AT models were somewhat compartmentalised, which, along with human trading, helped to sustain market quality beyond the CHF currency pairs. 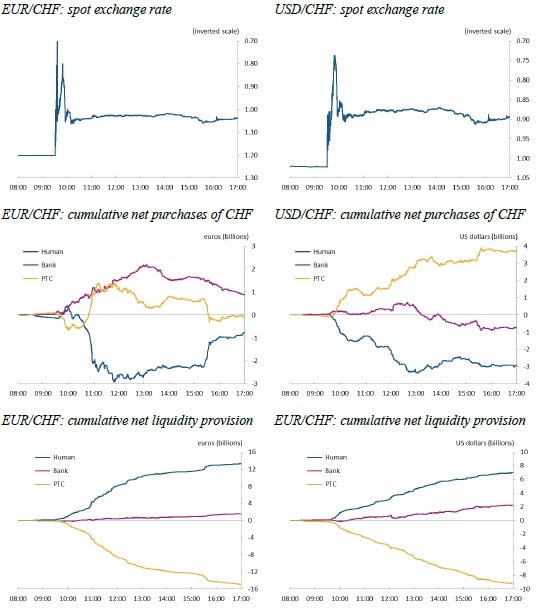 Figure 4 shows the prices at which different types of trader exchanged euros for Swiss francs in the 30 minutes following the SNB announcement depending on whether their trades were consuming liquidity (top panel) or providing it (bottom panel). Trades that consume liquidity result from IOC orders, while those that provide it result from GTC orders. The top panel shows that bank AIs consumed liquidity at extreme prices (prices significantly different to those of immediately preceding trades) on a number of occasions, notably between 9.31 and 9.36. Thus, over 75% of the cumulative appreciation of the franc in the 20 minutes to 9.50 was attributable to bank AIs, which accounted for 61% of the volume of liquidity-consuming trades. Indeed, we show below that bank AIs accounted for an even larger share of the realised variance of the EUR/CHF rate at this time. The lower panel shows that bank AIs also provided liquidity for some of the extreme-price trades. That bank AIs both consumed and provided liquidity at extreme prices may reflect the diverse set of traders from whom these trades may originate. This includes not only the different banks but also their various clients. In addition, a roughly equal number of extreme-price trades were accommodated by human traders. 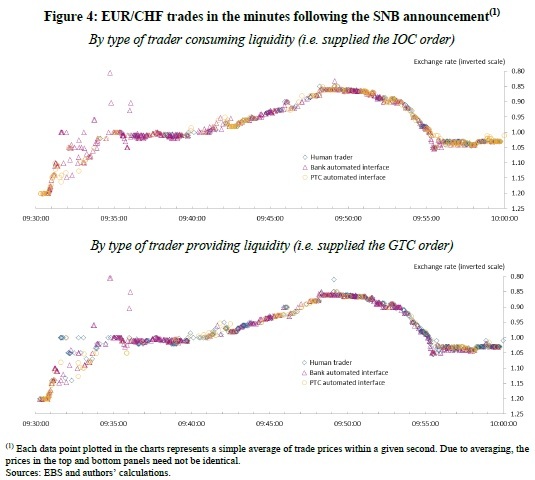 Indeed, human traders accounted for a significantly higher share of liquidity-providing trades (50%) than they did for liquidity-consuming trades (19%) during the 20 minutes to 9.50 when the Swiss franc appreciated sharply. Figure 5 gives an overview of the reaction of both the EUR/CHF and USD/CHF markets to the SNB announcement over the whole trading day of 15 January 2015. The first row shows that the Swiss franc appreciated extremely sharply against both ‘base’ currencies in the first 20 minutes following the announcement, but that sizeable portions of these gains were reversed in the subsequent hour. After that the two spot rates were much more stable, with the Swiss franc worth about 10% more than at the start of the day. The second row shows that algorithmic traders were net purchasers of Swiss francs over the day, particular bank AIs against the euro and PTC AIs against the US dollar, while human traders were net purchasers of the base currencies. Thus, computers traded ‘with the wind’, buying the franc as it appreciated, while humans ‘leaned against the wind’. Note, however, that human traders did not make net purchases of the base currencies in the key 20-minute period immediately after the announcement. Finally, the third row shows that human traders were consistently net suppliers of liquidity over the day, while PTC AI trades consumed it. However, as we shall see below, net liquidity consumption by PTC AIs is not unusual in these two currency-pairs. We study the theoretical implications of cointegrated stock prices on the profitability of pairs trading strategies. If stock returns are fairly weakly correlated across time, cointegration implies very high Sharpe ratios. To the extent that the theoretical Sharpe ratios are "too large," this suggests that either (i) cointegration does not exist pairwise among stocks, and pairs trading profits are a result of a weaker or less stable dependency structure among stock pairs, or (ii) the serial correlation in stock returns stretches over considerably longer horizons than is usually assumed. Empirically, there is little evidence of cointegration, favoring the first explanation. fits that are "too good to be true." The existence of cointegration essentially implies that the deviations between two nonstationary series is stationary. The speed at which the two series converge back towards each other after a given deviation depends on the short-run, or transient, dynamics in the two processes. If there are relatively long-lived transient shocks to the series, the two processes might diverge from each other over long periods, although cointegration ensures that they eventually converge. If the transient dynamics are short-lived, the two series must converge very quickly, once they deviate from each other. In the latter case, most shocks to the series are of a permanent nature and therefore subject to the cointegrating restriction, which essentially says that any permanent shock must affect the two series in an identical manner. In the stock price setting considered here, most price shocks are usually thought to be of a permanent nature. For instance, under the classical random walk hypothesis, all price shocks are permanent. Although current empirical knowledge suggests that there are some transient dynamics in asset prices, these are usually thought to be small and short lived. In this case, if two stock prices are cointegrated, there is very little scope for them to deviate from each other over long stretches of time. Thus, when a transient shock causes the two series to deviate, they will very quickly converge back to each other. Such quick convergence is, of course, a perfect setting for pairs trading, and gives rise to the outsized Sharpe ratios implied by the theoretical analysis. ts reasonably hard to achieve. 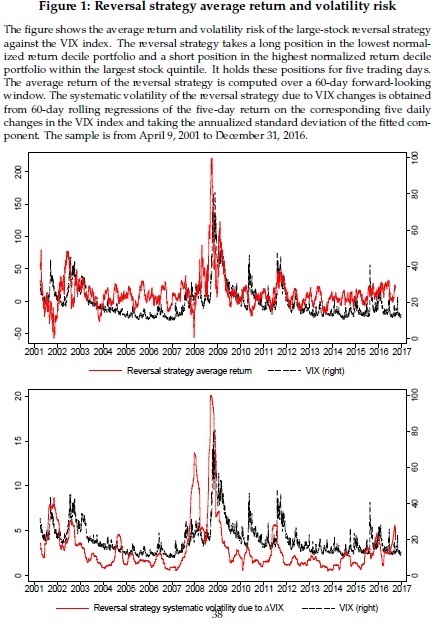 Or, alternatively, the serial correlation in stock returns must be considerably longer-lived than is usually assumed, with serial dependencies stretching at least upwards of six months. However, such long-lived transient dynamics imply a rather slow convergence of prices in pairs trades, at odds with the empirical evidence from pairs trading studies. In the second part of the paper, we evaluate to what extent there is any support in the data for the predictions of the cointegrated model. ffecting all stocks in a given industry." "Overall, the cumulative evidence points to time-varying risk premia as the pervasive source of the carry trade returns and to the forward premium puzzle not being without costs. Nonetheless, the identification of an appropriate risk premia that explains the carry trade profitability remains an ongoing debate. This paper provides new evidence in favor of sovereign solvency being a potential source of risk in currency market. This paper contributes to current debate by revealing a new economic-based time-varying risk premia in the currency market that depends upon a country’s solvency. We argue that the financial capacity of the economy, captured by the solvency measures, incites the differences in average carry trade excess returns. In other words, the profitability of currency carry trades can be rationalized by the time-varying risk premia that originate from the sovereign solvency risk. Consistently, we find that high interest rate currencies demand a higher risk premium, as they deliver low carry trade returns at times of high solvency risk, therefore exposing investors to more risk, whereas low interest currencies are a hedge against the solvency risk. In this paper we assume risk premium is a function of financial solvency of the economy, defined by either a ratio of foreign debt to economy’s earning ability (henceforth, the solvency measure), or a ratio of balance of the current account to the estimated aggregate of total exports of goods and services, or aggregated financial solvency index. Risk premium is then represented by an increasing convex function of one of these measures. In the most of our analysis, we consider external debt service capacity measured by the gross foreign debt-to-output ratio as a measure of solvency of the country. We perform portfolio sorts on forward discounts and the solvency measure, identify risk factor as the returns on zero-cost long-short strategy between the last and first solvency-sorted portfolios and label it IMS, for indebted-minus-solvent economies. The IMS factor explains the substantial part of the cross-sectional variation in carry trade portfolios, exhibiting monotonically increasing factor loadings and significant prices of risk, consistent with risk premia explanation. Moreover, the factor is empirically powerful in various model specifications and sample splits, prices different test assets, stands out horse races with other currency-specific risk factors, robust against an alternative funding currency (the Japanese Yen) and alternative solvency measure specifications, and passes several other robustness checks. Taken collectively pointing to the solvency risk factor being an effective tool for pricing the cross-section of carry returns." fied portfolio of foreign currencies, momentum strategies that buy currencies that appreciated in the recent past and short those that depreciated in the recent past, and value strategies that buy undervalued currencies and sell overvalued currencies. ting through FX trading, most notably central banks. t or lose money from their intervention operations? These are the questions that we address in this paper. cally, we use a subset of their data since we study interventions against the US dollar (USD) only, and we limit the sample of currencies to countries with (relatively) flexible exchange rate regimes and few or no capital controls. 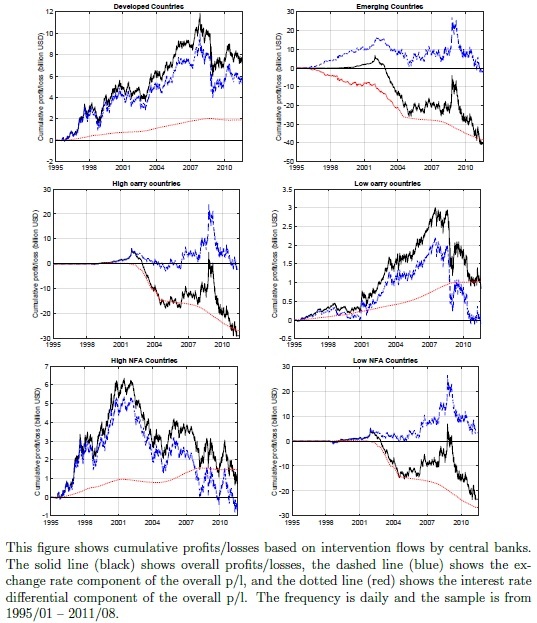 We study a cross-section of interventions in 19 exchange rates (all against the USD) by aggregating the interventions of the 19 associated central banks over the sample from 1995 to 2011.
nancial crisis lifted carry returns by about 5 percent. ffect is much more pronounced at times of market turmoil."